The biggest drain on a property is the main sewer line. All drainpipes from a property flow to the main sewer lines. When operating properly, the main sewer line will then flow to the city’s sewer line. However, in life, sewer line problems occur. 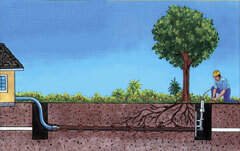 • Tree root infiltration – the most common cause of sewer line damage. Searching for moisture, roots are attracted to the vapor build-up around the pipe and eventually break into the sewer line for nourishment. Our video sewer inspection enables us to diagnose your sewer line problems. We insert into the pipe a flexible rod with a high-resolution miniature video camera on its tip to identify where and what is the cause of the problem. The recorded video allows us to discover which sections of pipe are damaged, crushed, broken, punctured, collapsed, disjointed, penetrated with roots, etc. The recorded video will inform us if an auger cleaning or forceful high-pressure wash out will suffice or if further repairs are necessary. When your plumbing isn’t perfect, E.Z. Roth Plumbing can help you with all repairs and replacements of your damaged or troubled water and sewer lines. When sewer renovations are necessary, we recommend the modern trenchless sewer repair process. However, there are times when the conventional sewer repair process is required. See below for explanation and illustration. Classically, after diagnosing that a sewer line needs to be repaired or replaced, plumbers access the damaged pipe in the yard or property’s ground by digging out a trench surrounding the damaged pipe area. When conditions permit, a trenchless sewer repair is preferred and superior since it’s generally less damaging, more economical and a faster process. The couple of days required to dig and refill for conventional sewer repairs is avoided; thus, avoiding the unnecessary harm or disorder to your yard, landscape, driveway, or any other construction on your property. All materials used in trenchless sewer line repairs are non-hazardous. • Pipe Bursting – Pipe bursting is a trenchless method of replacing buried pipelines without the need for a traditional construction trench. Called a ‘launching and receiving pit, our plumbers dig two entry points at both ends of the diagnosed pipe replacement section. An expanding device called an bursting-expander head is introduced into the defective pipeline through a launching pit. As it travels through the pipeline toward the receiving pit it breaks the existing pipe into many small pieces, pushing the pieces outwards into the surrounding soil. Extremely resistant to leaks and root infiltration, we attach a new, stronger pipe to the back of the expander head, replacing the old line immediately. • Pipe Relining – Pipe relining is a trenchless method of repairing a damaged sewer pipe by inserting a polyethylene pipe within the current pipe to craft a new stronger inner pipe. With pipe relining, the new pipe is placed inside the faulty pipe to repair the damaged areas. Since cracks, holes, or root-damaged pipes don’t necessarily require a full replacement of a sewer line, we perform pipe relining on particular sections of a sewer line that require repairs.